*The series continues in Turtle Soup (Vol. 2) #1. *This issue also contained bonus pin-ups by Gary Morita, Jim Lawson, Ryan Brown, Michael Cogliandro, Kevin Eastman, Michael Dooney, Peter Laird and Steve Bissette. *According to solicitations in TMNT (Vol. 1) #8, this was supposed to be a bimonthly series. 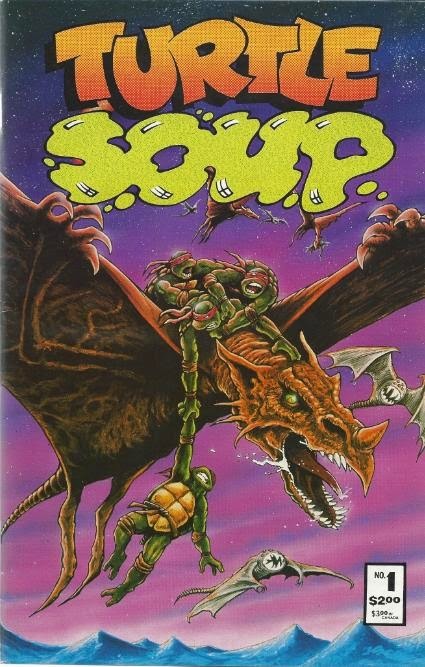 That didn't pan out, but this special did eventually spawn the four issue Turtle Soup miniseries. This issue was my first introduction to Eric Talbot's art. "The Howl" was pretty awesome despite its criminally short length. Also, the Turtle Dreams story was nicely illustrated. It just screams vintage B&W TMNT. I'm really looking forward to the day when you skewer "In the Army Now." That stupid story is the longest one in the whole anthology, whereas Talbot's "The Howl" only gets 4 pages!